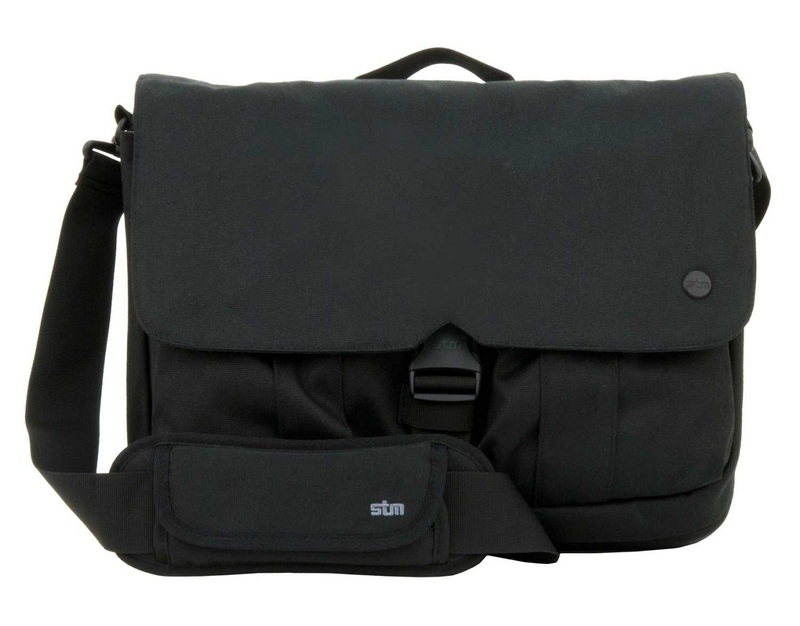 STM Bags have been selling the Scout 2 satchel for a little while now and I was fortunate enough to receive one at the end of last year for review and road test. Having seen the STM Convoy, Velo and Hood, I was interested to see how the Scout 2 worked from a practical point of view. 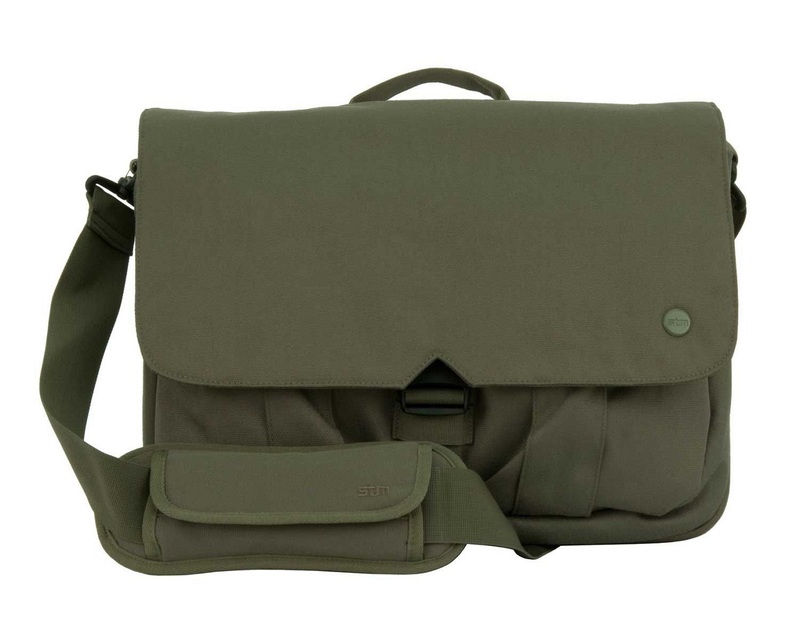 The styling is very much in line with the convoy in that it has larger pouches and is made of canvas but it’s a satchel bag and medium in size. The Scout 2 is a rectangular satchel bag with durable shoulder strap, 2 main compartments, 1 smaller internal zipped pocket and 2 front pouches. 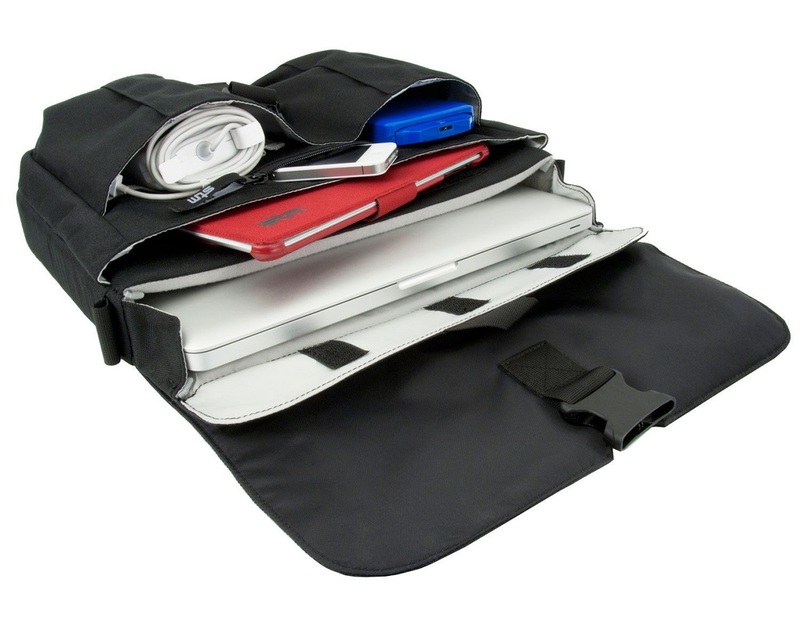 There is a rear document style pouch that also has a zip at the base so that you can loop it over your ‘wheelie’ travel bag. 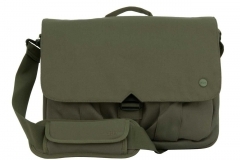 The Scout 2 can hold a 15″ notebook in the padded compartment at the back of the satchel. 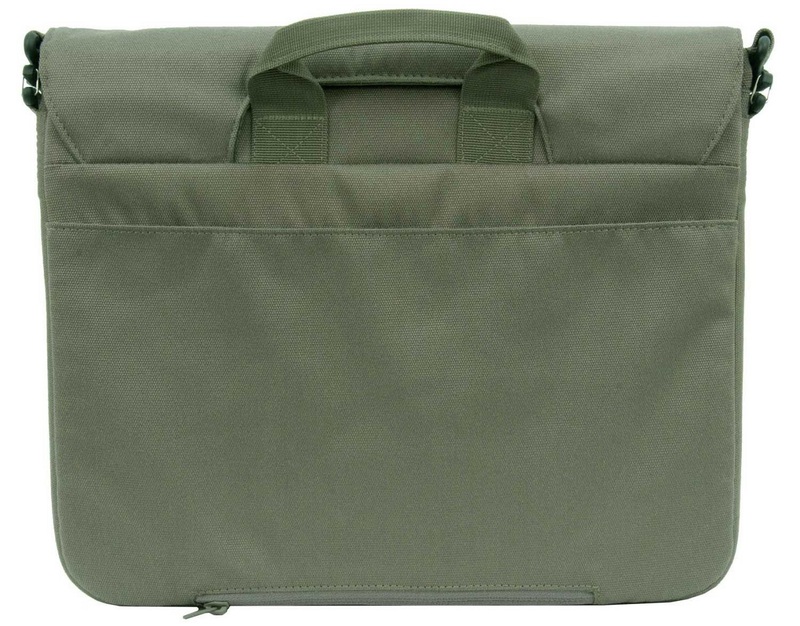 Our sample was the olive green canvas but it is also available in black – despite being a lighter colour, in general use, we didn’t get any marks on it nor did it show any evidence (water marks) from the day I was caught in a downpour without an umbrella. Here are some professional shots from STM to kick things off. I like to avoid carrying a lot of paper around but there is a time and place where a few sheets and a notepad/pen come in handy and the Scout allows for that. 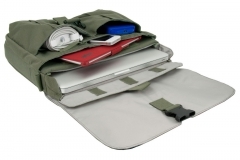 If you plan to carry textbooks, your lunch or anything substantial then you best look for something bigger. In terms of payload, I found that the Scout 2 carried everything I needed for my day to day. Although I was initially worried about things falling out of the 2 front pouches due to the lack of individual top flaps, I didn’t have anything fall out during the 4 months that I used the Scout 2 – that top flap with the adjustable clasp does a great job of keeping everything tightly squared away. There were many times when the satchel was flat on its back, on its front, side and even upside down. We found the Scout 2 online for $99.95 but in-store prices may vary. Super-comfortable shoulder pad and removable shoulder strap for a fully loaded pain-free carry The shoulder strap is even more comfortable than it looks – due to the size of the Scout Medium, there is a limit as to how much kit you can get in the satchel but unless you plan on carrying a couple of terracotta tiles, it won’t be an issue. At it’s heaviest, I loaded the Scout up with about 6kg and didn’t notice any pressure spots on my shoulder or signs of stress in the clips that hold the strap. The clips for the strap are easy to remove but I don’t know why anyone would want to take the shoulder strap off as the alternative handle is nowhere near as convenient for more than a minute or so. 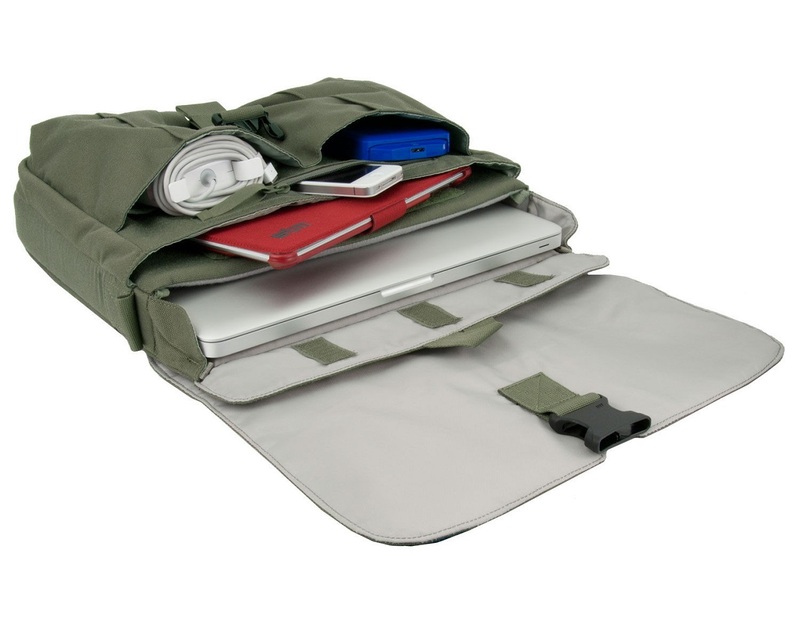 Large main compartment gives easy access to documents and folders Unlike the compartment for a laptop, this one doesn’t have the soft padded lining or the velcro flap. 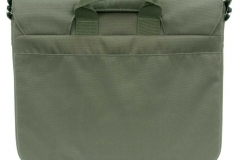 The main exterior flap does a good job of keeping the contents of the main pocket safe. I used this compartment to carry papers, a notepad, my wallet, travel itinerary and other random stuff. Front utility pockets hold keys, cords, and mobile devices and can be accessed without un-clipping front panel I was dubious about the front pockets but they are secure enough once the top flap is clipped in place. You can still get to them by folding up a corner and they do hold quite a bit. I had a mouse and laptop power cord in one pouch and a USB passport drive, iPhone, iPhone charger and pens in the other. Despite the bulk, everything stayed in place and didn’t look overly bulky from the outside. 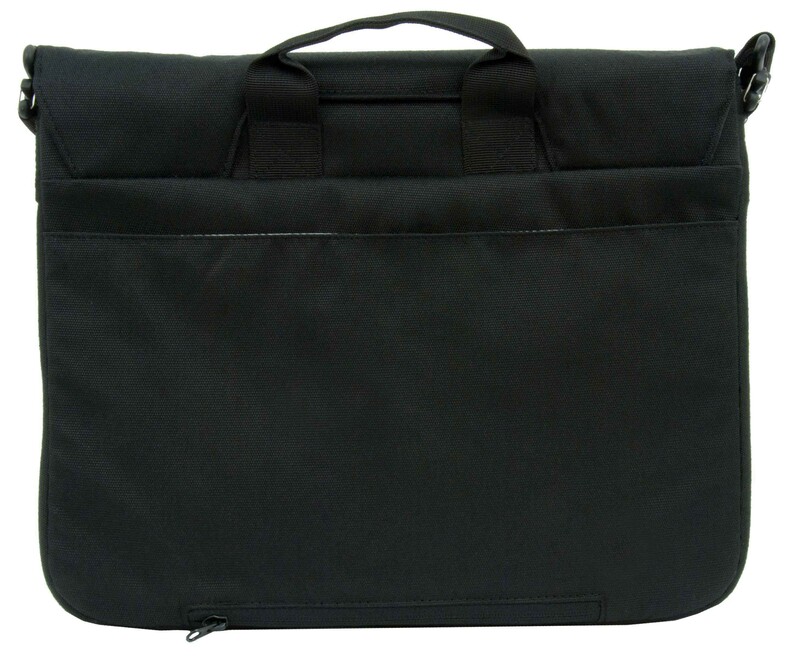 Holds most 15″ laptops My standard issue Dell Latitude E6420 fits in the main compartment with room for an iPad (original thick version) in it’s folio cover as well. Just make sure that your notebook isn’t longer than 365mm. Other things that I found really handy when using the Scout 2 were the zippered pocket and the main clasp. The zippered pocket is centred on the front of the satchel and great for things like loose change, USB keys, car keys, iPhone headphones and other items that I didn’t feel like carrying in my trouser pockets. The main strap is easy to tighten and can be managed for the most part with one hand which is great when you are on the go – or on the phone. The alternate handle at the top of the rear of the Scout 2 is ok but I wouldn’t want to carry it around that way for long. 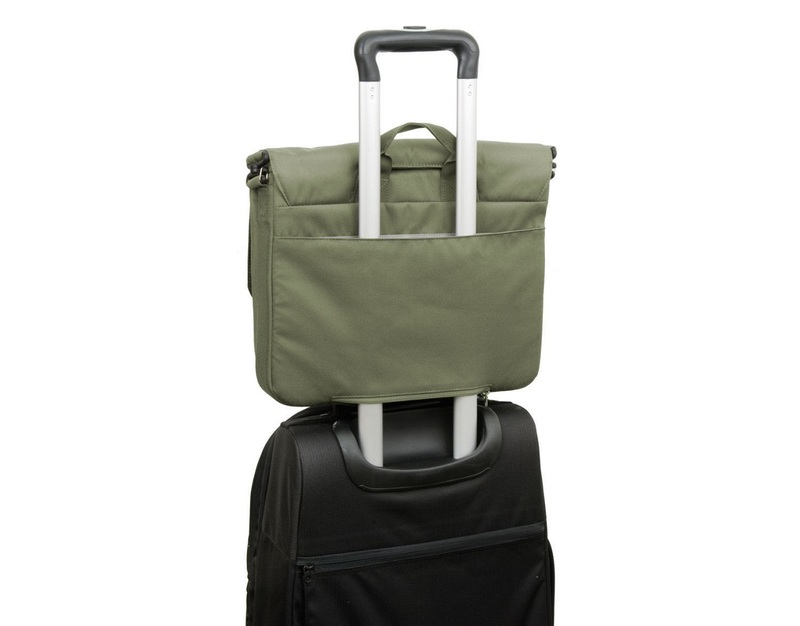 It’s good for moving the bag from one place to another, stashing it in an overhead compartment on a plane or the boot of a car but I can’t see it replacing the comfortable shoulder strap. There is also a hook/clip inside the front left pouch that could be used for a key chain or something that typically stays with your bag but not always in it. As usual, the STM branding is subtle with a small button on the main flap and an embroidered ‘STM’ on the shoulder strap pad. 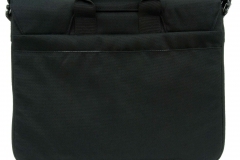 Previously, I awarded the Velo with the “Editor’s Choice” as it was well made, well priced and very practical – as such, it set the benchmark for us moving forward when looking at other bags / satchels. Compared to the Velo, the Scout 2 doesn’t have the same level of organisation in terms of separate compartments but the design is more stylish. 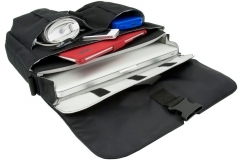 The Scout 2 was able to carry everything needed for business which meant that is was practical enough for my purposes and therefore the average professional or student. The manufacturing quality of the Scout 2 review sample I received was flawless. Due to the amount of travel that I did with the Scout, I was expecting a pulled thread, scuff marks or other signs of wear but after 4 months, it still looks basically new. Although I still rate the Velo as the best satchel I’ve ever used it’s fair to say that it isn’t for everyone in terms of style and taste – STM has traded a few of the practical features that I liked in the Velo to suit a different look with the Scout 2 whilst still catering for my day to day needs. 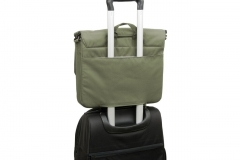 One other thing about the Scout 2 that makes travelling with it easier is the way it holds its shape and remains easy to fit in confined spaces – I found it to be light and easy to manage with my business travel. 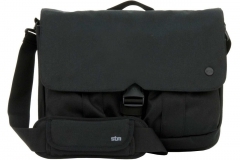 As an aside, STM have other ranges in the process of being launched at the moment so if you found this review interesting check out the full range of laptop satchels at the STM website.